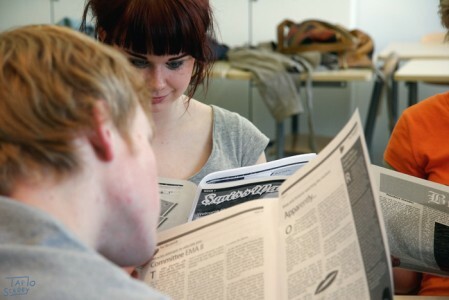 European Youth Parliament Finland will organise its traditional Journalists’ Training in Turku on 29 June – 1 July 2012. The training will gather 16–20 participants and provide them with the essential skills and knowledge needed in press rooms at National, Regional and International Sessions. Topics include but are not limited to working practices of EYP press rooms, proper style, photography and filming. It is primarily meant for alumni who have recently been delegates and now wish to move on in the EYP, and it will thus also cover the role of session officials more broadly. The working language of the training will be English. The training will be led by Jari Marjelund (Editor, Lillehammer 2010, and a member of the Pool of Trainers) and 1–2 other trainers (to be confirmed soon). Participants are asked to arrive in Turku by 5pm on Friday 29 June, and the training will end by 5pm on Sunday 1 July – well in time for the final of Euro 2012. Accommodation for extra nights before or after the training may be provided but is not guaranteed. The participation fee for the training is 35 EUR, and it covers programme, accommodation and food during the training. A number of low-cost airliners fly to Turku, and the city is easily reached from Helsinki International Airport, as well as by ferry from Stockholm. Applicants are asked to submit the application form at applications(at)eypfinland.org by 6 June. The form can be found at the Alumni Platform. All applicants will be informed of the selection’s outcome by 8 June. In practical matters, you can contact Alexander Proctor at alexander.proctor(at)eypfinland.org.